President Linda Reifschneider headed to Sri Lanka on December 11, 2017, to visit some of the people and projects we have been funding in that lovely island nation. Jayantha Jaywardene and his associate, Sudath, joined Linda for dinner in Colombo the evening of the 13th. Jayantha is the driving force behind the Schools Awareness Program which has been teaching school age children in Sri Lanka about elephant conservation and human-elephant conflict solutions. Asian Elephant Support has been delighted to help Jayantha keep this program running for class after class of school aged children. Then Linda headed to the Udawalawe National Park area. First stop was to visit Dr. Vijitha Perera, head veterinarian at The Elephant Transit Home (ETH). The ETH is an orphanage for young calves who are still dependent on their mothers’ milk. They receive 7 feedings every 24-hour period. Their days are spent in open forested areas and secure stalls at night. Linda had the opportunity to see a feeding at the quiet time of 10 p.m. The following day she returned to view the first public morning feeding and then headed into Udawalawe National Park to see lots of elephants, including many who were growing up there after being weaned and old enough to leave the orphanage. AES has been delighted to help Dr. Perera with funds to attend a vet workshop and look forward to working with him in the future. Visiting Sri Lanka would not be complete without a stop at Yala National Park and especially a moment at the 2004 Tsunami memorial. Linda was there a few years after the tsunami and this beautiful stretch of beach makes remembering the horrific loss of life during that event even more dramatic. An overnight stay at The Grand Hotel in Nuwara Eliya is always a very special treat and right on the way to Kandy. A visit to the Veterinary School at the University of Peradeniya provided a good opportunity to get updated on Sri Lanka Wildlife Conservation Society’s EleVet program, which is another effort AES has helped fund. And then, a special moment: the opportunity to visit the Kandy Temple elephants. Usually one only gets to see these elephants when they are on parade during a festival. So, to see their ‘digs’ and meet the mahouts who care for them daily was quite a privilege! Thanks to Dr. Ashoka Dangolla, professor at the University of Peradeniya, for facilitating this opportunity. 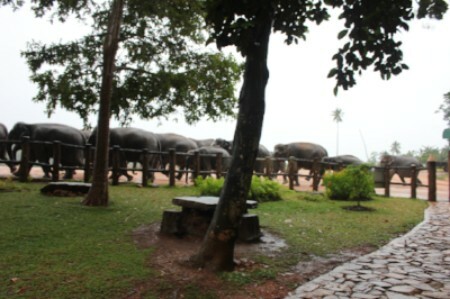 Of course, one does not go to Kandy without visiting Pinnewala, the largest and first elephant sanctuary in Sri Lanka. Linda was given a very good tour and visited with their elephants and staff. From there she joined Dr. Dangolla at The Millennium Elephant Sanctuary, down the road from Pinnewala, to visit with the volunteers helping care for those elephants. headquarters and where Linda spent two weeks on her first visit to the island volunteering in Ravi Corea’s Earthwatch project. Ravi is the founder and president of SLWCS and offers excellent volunteer opportunities for those wanting to learn more about Asian elephant conservation, and all the challenges facing these magnificent creatures, on a firsthand basis. Back to Colombo for Christmas Day, the anticipated manicure, pedicure, and massage didn’t happen: that staff was off for the Christmas festival! While AES is a totally voluntary nonprofit and we cover all our own travel expenses, YOU, our supporters, are the ones who make it possible for us to fund these various beneficial projects and needs. Thank you for helping us help elephants!